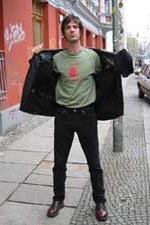 This is Stoney, photographed wearing an STM shirt in East Berlin. He played guitar in Sin Sin 77, records and produces records, does session work for legendary country and blues musicians, and runs his own vineyard in his spare time. 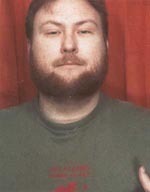 Tim of Kingston, Ontario, Canada, spends his spare time hanging around photo booths, in hopes the revolution will start there. Failing that, he can at least document the growth of the sort of beard that makes store owners and more conservative fellow queers nervous. Tim also does a zine called My Heroes Have Always Been Ponyboys and makes awesome mix tapes. He was also the responsible party behind Noise Queen. Chloe plays guitar, listens to music and reads books. This is her take on the classic green STM shirt. Note the missing collar and sleeves.